You keep hearing about FootGolf since it is the latest rage especially for the younger folks. You haven't tried it and you are thinking about it. Here is a special offer just for you! Grab a friend and come on out and see what the fun is all about with our 2 for 1 FootGolf green fee for any FootGolf rounds played before July 31st! Not valid with other discounts. Please present this for the special offer when you check in. And if you haven't done so, enter our contest below to win Unlimited FootGolf for the remainder of the year. Broadlands is proud to be the first AFGL certified 36 hole FootGolf course in Wisconsin. So let's celebrate! 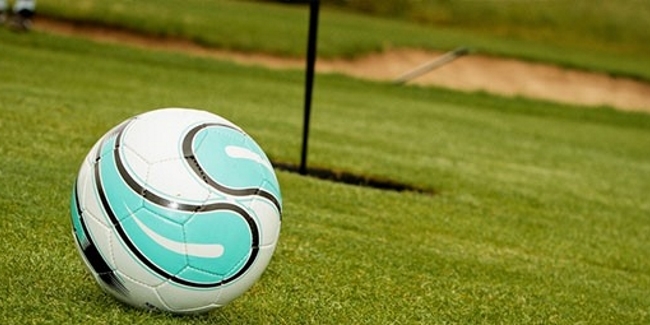 We are going to give away unlimited FootGolf to some lucky player for the remainder of 2015. That's right, play anytime you like for free! Broadlands is also offering junior rates to kids 17 and under! To learn more about FootGolf at Broadlands call (262) 392-6320 or visit http://broadlandsgolfclub.com/footgolf. Pat McCabe, a former University of Wisconsin - Milwaukee basketball shooting guard, can pop a three pointer from beyond the arc and sink birdie putts from the fringe. Pat is a regular golf contributor to GolfWisconsin.com, ChicagoGolf.com and IndianaGolf.com.